They are, but you have to ski them at least once regardless. The Hobacks must be skied. "Don't nobody leave without singing the blues". Question for JH regulars: 3 of us (55+ yo males, who drink) are driving up from CO tomorrow for a couple of days at JH; staying in Spring Creek area. Restaurant recommendations? Not looking for anything too fancy like Amagani (sp?). 1. 1. I-80 to Evanston, WY then highway 89. Only route that makes sense if going from/to Park City as I will in early March. (I plan to ski JHMR until 1 or 2, then drive 200 miles o Evanston and spend the night, then drive a little over an hour and ski Deer Valley the next day.) The time I did it, I was a passenger and was surprised at the amount of driving we did on snow covered roads. We had good visibility, but snow on road at least half of the way from Evanston to Alpine. Every though we were in a Subaru (WRX), it slowed us down and is not something I would have wanted to do in dark. Thanks. I took the advice above and rethought the trip. Will be staying in Sandy and skiing Solitude, Deer Valley and 2 days at Alta. I will save JHMR for later and allow for more time. Appreciate everyone's input on this. My favorites are Bubba's in town and a little secret gem - Teton Pines Golf course. The clubhouse is open in the winter, prices aren't too bad, and the food is excellent. It's on the road to the ski area near the Aspens on the west side of the Snake River. Other decent places I'd tout include Hayden's Post (in Snow King Resort), Thai Me Up (includes Melvin Brewing, who make an excellent double IPA called 2x4), and Snake River Brewing (very popular, almost as crowded as the Mangy Moose). There is a dining guide & map out in virtually any store in JH. Make sure you get one. Question for JH regulars: 3 of us (55+ yo malk es, who drink) are driving up from CO tomorrow for a couple of days at JH; staying in Spring Creek area. Restaurant recommendations? I don't know where Spring Creek is but I do know where Bubba's BBQ is. Take the main drag in Jackson and head north and it is on your right. Bubba's yum! Get the St. Louis ribs. 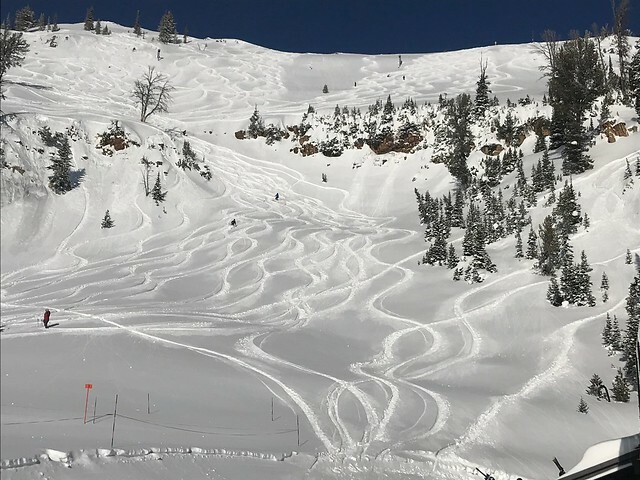 Meet Your Maker... Laramie Bowl and Cirque on the list along with Moran woods. Plenty of good skiing in other parts of JHMR. I was trying for the quintessential experience and the ones you need for future "Oh, you were at Jackson. Did you ski ...?" conversations. In my experience, the Cirque is hard to get to and tends to be sun affected. Moran woods are good. The woods at the back entrance to the Hobacks are very good, but again you are unlikely to find that spot on your own. Of course, the horrendous scraped off fifty feet at the main entrance is part of the Hobacks experience. I like Beartooth off the headwall (hike to get to it). That puts you at the top of Casper Bowl. Again, not that obvious where it is. But there is plenty of obvious good skiing, so don't make yourself crazy. More than 3 days worth. Hard to go wrong. The unofficial guide describes the entry to MYM and the Youtube videos are enough that I think I should be able to find it. I doubt I'll venture in the woods off of the Hobacks and will stick to the inbounds experience, icy entry and all. I'm from the east coast so I'm used to that stuff! Any thoughts on the necessity of AWD for these routes? We'll be making the drive from the SLC airport to Jackson in late January. I've got a minivan reserved with Enterprise at a great price. I could guarantee AWD through AWDRentals.com, but it will double the price of my reservation (from $344 to $686). Based on what I read here and other places I rented an AWD Sante Fe SUV from Alamo for $590, one-way from Jackson airport to Bozeman airport. Price jump was significant from a 2WD but I went for peace of mind. Alamo allows you to reserve AWD specifically? EDIT - Just called the SLC Alamo, and they cannot guarantee it but she did say that the "majority" of their SUVs in the location's fleet are AWD. Well, yes and no. The AFAIK Santa Fe is only comes as an AWD/4WD so if I get a Santa Fe I'll have AWD. If I get a "or similar" then I have a 50/50 shot. It was the best I could do. I don't love Bubbas... I think that Big Hole BBQ is much better. I also wouldn't recommend Haydens Post, The Gunbarrel, or Sidewinders. Most places in town are pretty decent. I really like The Bird a few miles south of town. As a former Philly guy, I also recommend Cuttys for pizza and "real" cheesesteaks. The Virginian has the best breakfast. Another decent place for breakfast is Noras in Wilson. I usually go skiing in the winter... Bell to Bell.... and don't have time to go out for breakfast. Sorry I missed your question as I was skiing with limited Internet. For all three routes I did between Jackson and SLC, vehicles had AWD and experienced winter drivers from CA. Teton Pass with much snow or ice on road is the only one where I think AWD would be necessary. The other routes would be easier and more comfortable with AWD, but unless you encounter more than a couple of inches of snow, you should be able to make it (with caveats following). The routes through Evanston or Soda Springs should be doable in a front wheel drive minivan that is not heavily loaded, depending on weather, for someone with winter-driving experience and assuming decent all-weather tires and that you do as much of the driving as possible that is not Interstate during daylight. The problem with front wheel drive is when they are heavily loaded, weight distribution shifts to the rear and can reduce traction. I've read the Hobacks and lower faces are hit or miss depending on the snow. @mdf :"They are, but you have to ski them at least once regardless." You know it's late...should we try to make the Hobacks? - Hmmm I think we could make it. Be close. It's probably going to be... interesting conditions. -So bad we have to do it. Last run? Of course. Skip the food. -Makes sense. Driving into town though, Christy looked up and started muttering about the Hobacks, swearing. I've never heard her curse out a place to ski. Said she hated them. That good, huh? The unofficial guide said as much. Okay, it's on the list and hopefully I'll get good snow. As for the Targhee question, maybe I'll ski the first 2 days at JH and see how much I get in. If I don't get my fill of JH I'll stay there for all three days. After all, this trip started as just JH and expanded to the Gathering and maybe Targhee. Get someone to come down to Targhee! 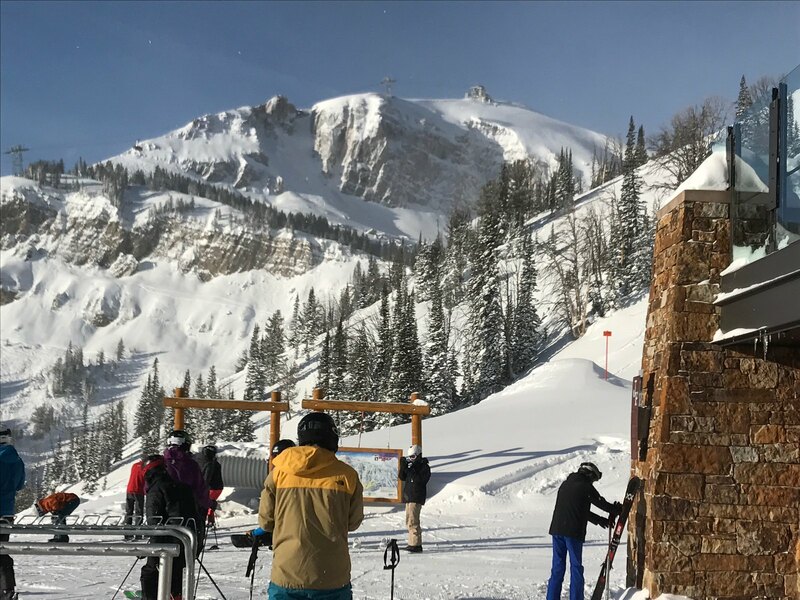 Best time to go Jackson Hole is ....yesterday. Tony, BC. and RJS like this. That looks sublime. Wow. Do you mind if I ask where on the mountain you took this picture?